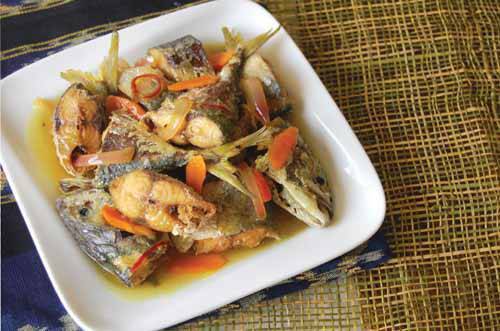 A simple fish dish using Mama Sita's Coco nectar vinegar with a hint of turmeric. 1. Fry fish and set aside. Discard the oil. 2. Heat 1 tbsp cooking oil. Saute onion and turmeric. As the onion wilt, add the water, Mama Sita's Young Coconut Vinegar, sugar, salt and pepper. 3. Cook over high heat and bring to a boil but do not stir. 4. Add the fish and continue cooking for another 5 minutes. 5. Stir in the dissolved cornstarch and continue cooking for another 3 minutes or until the sauce thickens. Serve immediately.